If you’ve been paying close attention to the coffee selection on Trade or your favorite local coffee shop for any stretch of time, you might have noticed some patterns to when different coffees appear throughout the year. When it’s mid-winter, roasters are putting out coffees from Peru like their lives depend on it, then suddenly spring is in bloom and it’s Ethiopian coffee as far as the eye can see. Colombian coffees, on the other hand, seem to be around pretty much whenever. What gives? As with pretty much all coffee info, we have to start with the idea that coffee is the seed of a coffee cherry that grows on a coffee shrub. And, as with all fruit, seasonality determines when that fruit can get picked. So, in the same way that you couldn’t visit an apple orchard in Connecticut in February and expect to pick apples, you can’t go to a coffee farm in Mexico in July and expect the trees to be full of ripe coffee cherry. 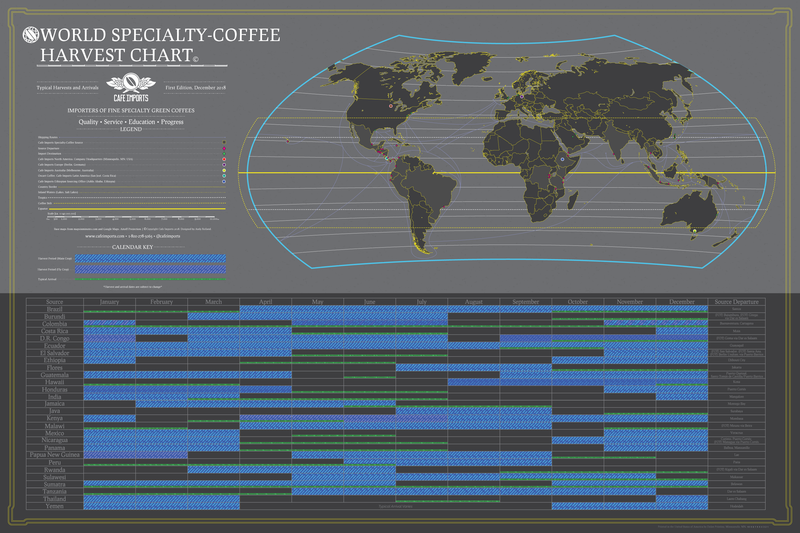 The harvest schedules for coffee growing origins differ based on factors like climate and their location on the globe. While you can be pretty sure that the best time to eat an apple is as soon as you take it off the tree, there are many things that need to happen with coffee. What complicates this even further is that while you can be pretty sure that the best time to eat an apple is as soon as you take it off the tree, there are many things that need to happen with coffee (processing, drying, resting, shipping, roasting, and more) that make predicting exactly when a coffee will be ready more challenging. We all pretty much agree though, that after a certain amount of time, coffee does begin to taste less good. Dried, unroasted coffee won’t rot in the warehouse like that bag of kale in the back of your fridge, but after a while it definitely stops tasting as lively and delicious. So, many coffee roasters adopt a seasonal approach to buying and roasting. They try to purchase coffee pretty soon after it reaches our shores, and gauge the right amount so it’s sold before it loses quality. For roasters with a seasonal approach to blends as well as single origin coffee, this presents a fun puzzle. We generally expect a blend to taste similarly throughout the year, and it’s totally possible to maintain a flavor profile while using fresh coffees. For example, a blend that uses a Peruvian coffee in the winter could replace that with a similarly medium-bodied, chocolaty, slightly fruity Honduran coffee in the summer and a Papua New Guinea in the fall. Some coffees, like Colombians (because of their two separate harvests, which is more common) and Brazils (thanks to their massive and well-developed infrastructure) arrive fresh throughout the year. Seasonality is by no means a blind adherence to a harvest calendar, and even if we wanted it to be, the increasing unpredictability of the climate would make that impossible. A rainy season comes earlier or later than it usually does, and suddenly farmers have coffee at a time they didn’t expect. On the roaster side, a coffee that tasted great for six months last year might start showing signs of fatigue after four months this year. Then you have to try to adjust the roast to make it taste as good as possible, or try to get it out the door ASAP. Though these challenges are usually resolved before the coffee reaches you, a basic familiarity with the general concept of seasonality will help you appreciate and enjoy coffees at their very best. Next articleEducationIs French Press Right for You?